Communication lecturer Chaz Evans and Jonathan Kinkley founded the Video Game Art Gallery in 2013 as a pop-up organization. This August, the nonprofit found its physical home in a roughly 800-square-foot venue downtown. Most people grow up thinking of video games as a purely recreational activity — but for Communication lecturer Chaz Evans, video games aren’t just ways to pass the time; they’re an art form. While Evans did grow up playing video games — mostly through demos in shopping malls and big box retailers like Best Buy — he realized early on they held a greater value than what met the eye. Evans went on to study art history in graduate school at the University of Illinois at Chicago, where he met Jonathan Kinkley, another student who shared his passion for video game art. The two kept in contact over the years in hopes of garnering more attention for this form of art in Chicago. Together, they founded the Video Game Art Gallery in 2013 as a pop-up organization dedicated to raising awareness and increasing cultural appreciation of video games and new media through exhibitions, events and educational programming. 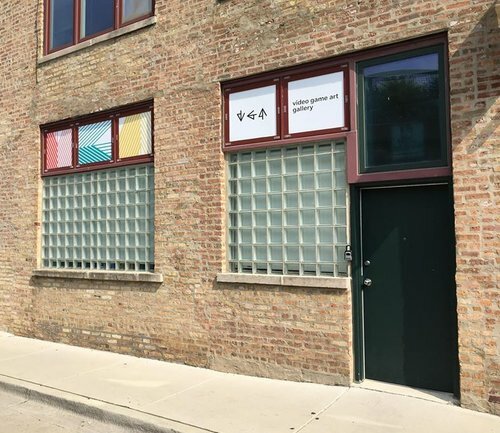 This August, the nonprofit found its physical home in a roughly 800-square-foot venue downtown — the first of its kind in the Chicago area. Kinkley said the gallery provides a space to study, critique and discuss games from an “art historical” point of view. Evans said the space mainly draws two types of audiences: people who are very interested in video games and those with a passion for making or writing about art. “There’s a lot that both groups can learn from each other … a contemporary art gallery that shows video games is the place to (bring together) those two groups,” he said. Brice Puls, VGA’s exhibitions and gallery manager, said the space showcases video games that are more experimental and outside the traditional realm of popular action and puzzle-based titles. Exhibitions are rotated on a quarterly basis and are selected by VGA staff, he said. The gallery’s upcoming exhibition, “The Ears Have Walls: A Survey of Sound Games,” opens Dec. 1 and will run until Feb. 25. The exhibit, curated by Evans and Communication lecturer Stephan Moore, features games that “invert the ratio of attention” between the audio and visual components of a game, Evans said. With this show, Evans and Moore plan to house a diverse and expansive collection of these titles under one roof so the games can be recognized as their own category. The selected artwork needs to satisfy two criteria to be part of the gallery, Evans said. In addition to emphasizing an audio component, the game must require “active listening” from the player. If a game can still be played after turning the sound off, that’s a sign it isn’t a good fit, Evans said. In contrast with previous exhibits, every piece in “The Ears Have Walls” will be interactive so visitors can directly play them using computers, tablets and VR headsets among other devices, Evans said. People can experience this focus on “active listening” in more than one way at the exhibit, he said. Instead of using traditional wall labels to present the works, visitors can download a mobile app to get an audio tour of each piece before interacting with it. Kinkley, Evans’ friend who became the executive director and co-founder of the gallery, said he is excited to see the work of local and international artists come together in one space. He added that Evans is quickly emerging as one of the field’s “leading academic and curatorial voices” in video games and new media. A previous version of this story was published with the incorrect photo. The Daily regrets this error.